I spend a lot of time thinking about bringing feed reading to a wider audience. A sobering statistic is that the overwhelming majority of web users, upwards of 95%, have no knowledge of the technology or how it can help them stay on top of content they're interested in. There are two distinct feeds associated with this web page, and no good way to differentiate them using the metadata provided in the LINK tags. This is inconvenient for the advanced user and downright confusing for the novice. The end result is a more consistent feed subscription experience on the wild, wild web. Now and then I look through all the files on my powerbook and remember that I've always been lucky. I've never had a catastrophic disk failure or inadvertently formatted the wrong volume losing years of irreplaceable data. I have partial backups here and there, but they'd provide only a small cushion. It's time to come up with better system, while I'm still a statistical outlier. In an ideal world I'd have every last byte of my digital existence versioned and mirrored across geographically distributed data centers. Failing that, I think a ReadyNAS from Infrant Technologies might do nicely. I need a mass storage device with redundancy and plenty of room to grow, but quiet and small enough to stick under the couch. Something I can throw multiple backup disk images at and still have scratch space left over for when the powerbook is down to its last gig. ReadyNAS seems to fit the bill. Anyone out there already using one? Sage gets a generous amount of attention from the blogosphere, but there's still something special about seeing your work mentioned in print. 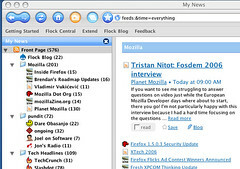 We get favorable reviews by Om Malik in a Business 2.0 article, and more recently in Firefox Secrets by Cheah Chu Yeow. An interesting link from a William Gibson post. A renaissance art form lives on in Switzerland. Dating back to da Vinci, the European fascination with automata created what could be thought of as the first robots, man's fledgling attempt to mimic natural processes. I've always been interested in the work of Jacques de Vaucanson, whose creations were some of the most intricate. They haven't survived the ages, but Vaucanson's duck and flute player are thought to represent the height of the automata craze. The most unusual thing Jimmy had managed to score on his swing through the archipelago was a head, an intricately worked bust, cloisonné over platinum, studded with seedpearls and lapis. Smith, sighing, had put down his pocket microscope and advised Jimmy to melt the thing down. It was contemporary, not an antique, and had no value to the collector. Jimmy laughed. The thing was a computer terminal, he said. It could talk. And not in a synth-voice, but with a beautiful arrangement of gears and miniature organ pipes. It was a baroque thing for anyone to have constructed, a perverse thing, because synth-voice chips cost next to nothing. It was a curiosity. Smith jacked the head into his computer and listened as the melodious, inhuman voice piped the figures of last year's tax return. In rambling around the web recently, I came across the new work of an old favorite author whose thoughts I've always found interesting. As a student years ago, the Connections column by James Burke was probably the sole reason I maintained my subscription to Scientific American. It was always the first thing I flipped to in a new issue, and often the last. In it, he traced the influence of people, events, and scientific thought through time to uncover interesting relationships. A continuation of his work on the famous BBC series with the same name, the column may not have been as scientifically rigorous as the articles that accompanied it, but its sheer scope and untethered historical insight made it simply addictive. It seems that James has an up and coming project known as Knowledge Web that aims to enable his tangential style of discovery in an online learning context. As he explains in a related interview, the web-based tool would allow the user to visualize and explore a network of interdisciplinary connections that Burke and other researchers have compiled over time. Think of it as Friendster with renaissance thinkers, monarchs, and modern scientific heavyweights for profiles. What a great little tool. So clean, lean and fast. Bloody marvellous! This is the best integration of RSS and a browser i've found! I don't need RSS support in Thunderbird or the Fox's Live Bookmarks or an external Feed reader anymore. Sage rocks. Om Malik has an article in the November issue of Business 2.0 that sheds light on Firefox as a platform for application development. It's good to see this aspect of the Mozilla project getting attention. Mozilla technology is more than a means of experiencing today's web, it's a big step towards creating the extensible rich client of tomorrow's web. Some of our goals in the next 12-18 months include improvements to the core rendering technology to make web developers' lives easier and also "productizing" the application development platform if you will, so that people will be able to download a "XULrunner" (with Firefox, probably) and then run other compact applications on it. If the push to neatly package and spread Firefox to end users is the first phase of adoption, the second will be the formalization and popularization of its development environment. Applications drive platform adoption. Right now, the excellent web browsing experience you get out of the box is driving adoption, this is the first application. Soon we'll see the development of third party XUL apps that, in and of themselves, can provide the incentive needed to download and install Firefox.